Up to the 19th century, it was very common for upper and middle class individuals to have surgical procedures done by private practitioners at their residences. In fact, it was overwhelmingly preferred to have surgeries done at home as opposed to in hospitals, which were often and accurately associated with infection and poverty. Even though the hospitals often had more skilled and experienced surgeons than private practices, due to their heavy case loads and wide-range of medical knowledge, surgical procedures done at home were on average, far more successful than those done in hospitals due to the high probability of infection. Additionally, surgery at home was appealing because it included psychological and physical comfort. The large rooms were crowded with the sick and cluttered with medical supplies and waste. Screams and other gruesome noises filled the air of the hospital. Apprentices needed to squeeze into tiny spaces and climb up onto beds in order to observe an operation. The duel-nature of patient wards as surgical spaces and recovery quarters resulted in not only lots of infection, but also difficult recovery periods for surgical patients. 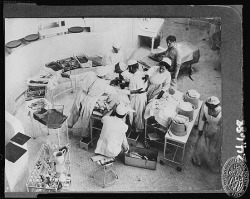 Johns Hopkins Hospital operating room in the late 19th century is representative of the drastic changes made in the late 1700s. Operating rooms were separated from the rest of the hospital. Surgery became specialized. The second half of the 18th century prepared to drastically change the hospital to a medically-based establishment. Operating rooms were separated from other rooms in the hospital. Surgery became a specialization and surgeons pushed for their own space, their own equipment, and their own nurses. 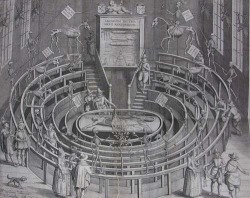 The first operating room was created in the early 18th century and was used as a paradigm for future operating rooms. A representation of an old 19th century operating theatre. In the 18th century, the medical amphitheater took on a new function: the viewing of surgeries on live patients! Most operating rooms were essentially amphitheaters and sometimes allowed as many as 450 people to view operations taking place in hospitals. After the development of anesthesia in the 1840’s, the disturbing screams of pain associated with surgery were silenced, and more people started attending surgical demonstrations, which no longer displayed patients suffering. Surgical demonstrations really took off as a form of entertainment in the 1870’s and 80’s, so much that some hospitals totally re-vamped their theaters to appeal to the wealthy individuals viewing the operations. Although it is easy to see the progression of surgery, it is important to note that there were many problems with the operating theatres.